This week Darkroom Door have partnered with Helmar for a 'Challenge Week' where artists use Helmar adhesives, Darkroom Door stamps and paper products to create projects to inspire you! We will share projects all week here on the Darkroom Door blog! The Helmar Design Team will be showing different projects on their blog all week too, so be sure to jump on over to the Helmar Blog to take a peek at what the Helmar girls have been up to! There's also a great prize package to give away from Darkroom Door and one from Helmar, so make sure you LIKE our Facebook Pages (links below) and then visit both blogs and leave a comment about the projects as well. I am excited to be one of the Guest Designers for the Darkroom Door and Helmar Blog Challenge - thank you Rachel Greig for inviting me! 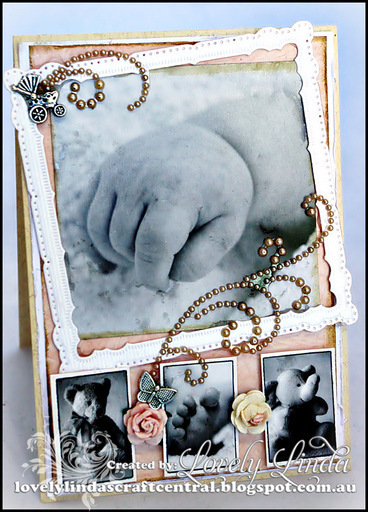 I have had such fun creating For my project I have created a Tin of Six Baby Cards, using the Darkroom Door Hello Baby Collection and Helmar products. There are quite a few photos, so I will keep the chatter to a minimum and just add the products I have used for each card. 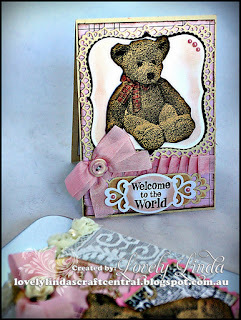 I have used the adorable bear from the Hello Baby Collection,layering it onto the Spellbinders™ Labels One , Scalloped Labels One and Decorative Labels One Nestabilities®, along with Fancy Framed Tags Two Shapeabilities® for the sentiment. My paper is from Teresa Collins, the pearls from Want2Scrap. The ribbon is Seam Binding. Helmar Liquid Scrap Dots are perfect for popping up your layers, giving that extra dimension. I have added them under the Teddy Bear and also the sentiment. One of the great things is you have control of how high your layers are. The Helmar Liquid Scrap Dots also dries fairly quickly, but you will need to put it aside for a little while - to make sure you do not flatten them while still drying. is created using Darkroom Door Hello Baby PhotoChips and Hello Baby Montage. Helmar Liquid Scrap Dots has also been used to layers the Spellbinders™ Marvelous Squares Nestabilities®. Helmar 450 Quick Dry Adhesive is perfect for attaching the Seam Binding Bow to the card - and lives up to it's name - it is so fast, I love that fact. It also glues the lace, Mulberry Rose and charms beautifully. The Bootees from the Darkroom Door Hello Baby Collection have been stamped, cut out and popped up using the Helmar Liquid Scrap Dots, onto the Spellbinders™ Asian Accents Shapeabilities®. The background is embossed using the Spellbinders™ Regal M-Bossabilities™. The bling flourish is from Want2Scrap. The adorable photos from the Darkroom Door Hello Baby Photo Montage work beautifully with the Spellbinders™ Snapshot Shapeabilities® By Licensed Designer Donna Salazar. The Words from the Darkroom Door Hello Baby - Wordstrips have been attached using the Helmar Premium Craft Glue and the camera adhered using the Helmar Liquid Scrap Dots. The versatility of the Darkroom Door Hello Baby Collection. The bootees take on such a real look when stamped. They have been popped up onto the Spellbinders™ Vintage Lace Motifs Shapeabilities®, again using the Helmar Liquid Scrap Dots - I love this stuff!!! Recycled lace has been added and the sentiment is from the Hello Baby Boy - Wordstrips and has been adhered to the Spellbinders™ Vintage Lace Accents Shapeabilities®. Finishing off with buttons and Want2Scrap bling. 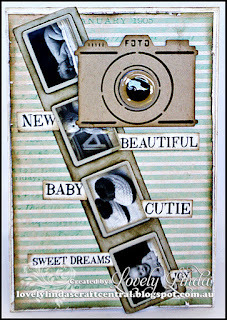 My last card is created using the Darkroom Door Hello Baby - PhotoChips, that has been layered onto a later from the Spellbinders™ Marvelous Squares Nestabilities®. Photos have been added from the Darkroom Door Hello Baby Photo Montage. Seam binding and a vintage brad finish off this card. Thank you for visiting today and for making your way through the post. I hope you are inspired to have a look at the fabulous range of product from Darkroom Door. I had the honour of meeting Rachel Greig at the Craft Show in Canberra and was greatly inspired by her. Rachel is an amazing artist and her product is fabulous to use. Make sure you check out Helmar as well - I am a convert and just love their adhesives - Liquid Scrap Dots has found a permanent home in my Craft Room. Make sure you check out both Darkroom Door Blog and the Helmar Blog for all the inspiration that is being shared all week! Don’t forget to HOP over to Helmar Facebook Page and the Darkroom Door Facebook Page and then leave your comments on the Helmar Blog …..AND….the Darkroom Door blog. Leave your comments by Saturday 22nd December 2012 and we will announce the winner here on our blog on Sunday 23rd December 2012! This card combines my favourite colour combination with two DD stamp sets: Trees DDRS018 and Love Birds DDRS057. I keep trying to escape my purple and blue obsessions but it draws me back time and again! I used a heavy white card to work on, spritzing with water first, followed by Adirondack Colourwash Dyes in Purple Twilight, Stream and Denim. Wetting another piece of card and laying it over the inked one before pressing gently and lifting away gave me two coloured backgrounds to choose from. I like it if the colour doesn't quite reach every edge as it gives a more watercolour painted effect. I painted water in a circle at the top right and heated this area to remove some of the colour and give a pale moon effect. A few dots of water gave some simple stars as well. Next I stamped rows of the trees across the card, as well as the bird flying over the moon...it's a great bird image, simple but with enough detail to make it more than just a regular flying bird silhouette! I used a black Le Plume pen to add the ground and the fine point of the same pen to sketch some grassy tufts to break up the flatness. I mounted the image onto white and then black card and attached to a card blank. I then used one of the quotes on white card, tore roughly around it and smudged some ink around the edges before attaching with 3D foam. The trees in this set are really finely detailed and I like the fact that the quotes are in a simple font and small enough to include on a card without overwhelming it. They draw you in to read them and the sentiments could suit many occassions. I've mixed afew products and techniques on this romantic canvas which measures around 4" x 4" and 1.5" deep. I painted the canvas with white acylic paint and, once dry, I stamped the DDBS014 Postcards Background randomly over the surface in black ink - I used it without an acrylic block so that I could use finger pressure where I wanted to apply it. Once fully dried I then worked layers of pale aqua acrylic paint over the surface so that the postcard images were overlaid for a very soft effect. Note that stamping onto a canvas leaves a hit and miss image unless it's primed with a smooth gesso surface first. I then used Viva Decor Precious Metal paint in Crimson, applying it with my fingers and blending it softly over areas of the canvas. It gives a lovely pearly finish that's quite subtle when applied this way. I used one of the small images from the Love Letters Montage sheet and edged it with a little Bundled Sage Distress ink before stcking to the canvas using Multi Matte Medium. I stamped the sentiment from the DDRS091 Wings set onto white card, tore round it and blended pink and green inks over it before glueing above the image. The flowers were created from white card which I inked with Victorian Velvet Distress ink. They are torn circles with five cuts that, when scrunched, give the petal effect. I have to thank my friend Paul for this technique which you can see by visiting his blog here. I made three various sized flowers and attached them to the canvas using Glossy Accents. I next stamped a selection of the butterflies, from the Wings set, onto white card using Archival Jet Black ink. I blended a selection of colours of Distress inks over them and heat set them to make the inks more stable so that I could spritz a little Perfect Pearl Mist in Perfect Pearl (white) shade. Once dry, I bent the wings up from the bodies and gently curled them around a pen to shaped them before adding to the canvas. I drew the antennae back in with the fine end of a black Le Plume pen - life's too short to cut around antennae in my opinion! Lastly, I cut a selection of words from the Love Letters Wordstrip, edged each with smudges of ink and stuck rnadomly around the canvas sides and peeking out from one of the flowers. 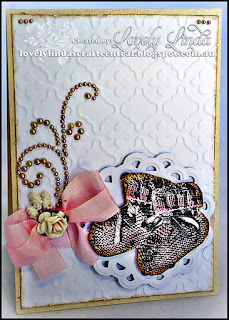 I love the vintage images on the Love Letters Montage sheet - full of Victorian melodramatic charm! I know I'll be using the Wings set over and over again as you can't have too many butterflies! I used a few alcohol inks on this card, along with the new Etched Flowers DDRS088 stamp set and DDBS012 Scratches Background Stamp. I started with some white cast coated gloss card. I added snakey trails of Stream, Purple Twilight and Sailboat Blue Alcohol ink across my craft sheet in an area about the same size as my gloss card. A few sprinkles of Blending Solution were added and I then swooshed my card, gloss side down, into the inks to pick up the colours. I love that you never know quite what you'll get! Next I spritzed a little Tsukineko Stazon stamp cleaner onto the inked card and heat set it. The stamp cleaner is a solvent based one, so it draws the colour out to leave a subtle speckled effect. Next I stamped the flower panel over the inked card using a Jet Black Archival ink pad, and did the same with the sentiment. Archival ink is the best one to use with alcohol inks as it's an oil based permanent pad so won't effect the colours. However, you do need to heat set it before you move on or it will smudge on gloss card. I cut the sentiment into a panel, matting onto white and then black card. THe flower panel was cut round and set aside. I tore a white card bigger than the flower image and then tore into the edges to create a shabby look. 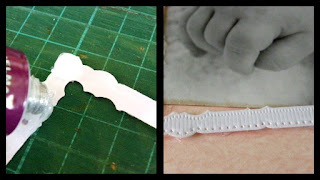 I rubbed a glue stick over the torn areas and dipped into silver embossing powder and heated. This was then layered onto black with the flower panel on top. On the card blank I stamped the Scratch background in black then blended Distress ink over it - Brushed Corduroy and Broken China. I rubbed the black ink pad around all four sides to edge the card. I stamped the panel of smaller flowers a couple of times onto white card using black ink and smudged the same colours over these. The individual flowers were cut out and set aside. To assemble the card I stuck the flower panel to the left and added the sentiment to the right with 3D foam. Next I put a little Glossy Accents to the back of the little flowers and tucked them behind the word panel. The final touch was to highlight the flower and words using an Inkssentials white pen. A simple card but I really like using reverse silhouette stamps over inky backgrounds as they look different every time. I do love making tags! I had no idea what this one was going to turn into when I started it, which is often the way I prefer to work - I really enjoy seeing how something develops. Here I cut a large Grungeboard tag and painted it with two colours of Viva Decor Croco in Turquoise and Gold. I splodged a nice amount of the Turqouise in the top right and a little less of the gold at the bottom left before swooshing them over the tag with a brush, vlending the colours slightly where they met. This was a reasonably thick coating but dried pretty quickly in my sunny workroom, giving a really dramatic crackle effect. After looking at the crackled tag I then went through my DD stamp collection to see what inspired me. I plumped for the DDRS055 Seashells set which I thought would be perfect with the colours that made me think of sea and sand. I stamped the shells and starfish onto white card using either Coffee or Jet Black Archival ink so that some would look more faded than others. Each was then cut out and smudged with Distress inks, with stronger colour around each edge. I stamped the two words with Jet Black on white card just adding a little Distress ink around the edges to soften them. After a bit of moving things around I decided on the position of each image and attached them to the tag with a mix of Glossy Accents and Silicon Glue. I stamped the seaweed/coral onto heat resistant acetate with the Archival ink, dried the images and coloured them on the reverse with Promarker pens - alcohol ink could also be used of course. 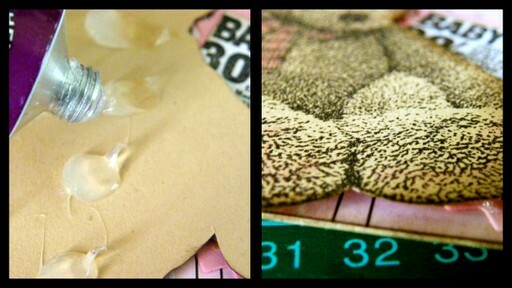 I cut them out (easy being acetate as you can leave a border!) and tucked them in around the shells using Silicone Glue. The whole thing was finished with a few toning fibres. I so enjoyed making this and the colours are just me! The sheen and crackle of the Croco paint is so vibrant and contrasts with the soft, matt colours of the shells. We've had so much fun sharing Lindsay's projects with you this week!! Her creations are always so colourful and full of great techniques and textures!! A big thanks to Lindsay for sharing how she created each piece too, I'm sure you have all been able to learn a few new tricks!! Please help me thank Lindsay by leaving a comment here for her! Don't forget to check out Lindsay's blog so see more of her artwork and check out where she is demoing and teaching. I love watercolour stamping and these silhouette flower images are just perfect for this technique. I used both DDRS005 Wildflowers vol 1 and DDRSO17 Friendship Flowers along with a selection of Marvy Le Plume pens, Glossy Accents and a 300gsm weight white card from Personal Impressions. Plus a few Distress inkpads of course! I find that either a heavy weight, high quality card or a smooth water colour card are ideal to create a truly watercoloured effect. Each flower stamp was coloured directly with three toning shades of pen, such as a pink, orange and coral, or a lilac, blue and purple. I then used yellows and greens on the stems before "huffing" on the surface (posh term for breathing!) and stamping onto a 5" square of card. I built up the flowers, leaving a clear area at the left for the sentiment. The sentiment was coloured with several shades, huffed and stamped. I then added the dragonfly which I also stamped onto seperate card, cut out and stuck to the base image along the body only. Glossy Accents gives a nice sheen to the body. I next blended Distress inks around the card panel (Broken China and Peeled Paint in this case) to give a soft background.The grasses are simply created by using the edge of a piece of card dipped into watered down Peeled Paint ink on my craft sheet. I finished the panel by dipping a soft brush into watered down Distress inks and lightly tapping the handles to give little flecks of colour in the background. The card itself has more flowers created the same way, but this time I used each inked image more than once to give a softer look to some of them. I blended Dried Marigold around the edges and then stamped the teeny butterfly in the corner, adding a second one over the top. It was then just a case of adding the panel to the card - simple but I like the depth that this technique gives. I can't speak too highly of the Dressmaker stamp set DDRS085 - really great images with a lovely vintage feel. I combined them here with the Measuring Tape background stamp DDBS018 which is huuuuge.....large enough to completely cover an A6 card blank. For this project I used one 3" x 3" compartment from a Tim Holtz Configuration box as the starting point. I stamped the Measuring Tape image onto white card, using Distress inks to blend a mixture of neutral shades over the design. I cut pieces to cover the outer sides of the box. For the top of the box I stamped two cotton reel ends. I rolled up a length of black card and attached the stamped circles to either end. Wrapping some cord around the reel completed the look and I stuck this to the lid using Glossy Accents. I stamped the Measuring Tape from the set, tinted it with ink and embossed one end as before then folded it up and attached to the lid. I stamped the pattern piece image several times onto cream card using Tea Dye Distress ink for a soft look. These were cut to size to fit the insde back and sides of the box. I next used Tim Holtz Tissue Tape to cover each edge of the box which neatens the whole thing. Once this initial work was done it was to enjoy decorating! I cut some individual strips from the Measuring Tape background and inked along the edges to define them. I applied glue stick adhesive to one end of each strip, dipped these into gold embossing powder and heat set them to represent the metal ends of a tape measure. These were then stuck randomly inside the box back and sides. The various items I added to the interior were the wonderful scissors (just love this image!) which were stamped in black, coloured with a Marvy Le Plume pen and coated with Glossy Accents. Once dry, the scissors were pretty strong and I was able to angle them into one corner. The little thimble was done in the same way. I squeezed some Distress Re Inker (Walnut Stain) a Tim Holtz Corked Vial adding Glossy Accents around the rim before replacing the cork to avoid spills and leaks later on. The Sewing Machine Oil image was stamped onto thin card, distressed with brown ink shades and then sprittzed with water to create speckles to further age the label which I stuck to the glass vial. The bobbin image was stamped three times and each wrapped with threads before adding to the box. I also wrapped some loops of thread with tiny strips of Tissue Tape to represent skeins of thread and a couple of glass headed pins completed the interior. I dyed some Vintage ribbon nicked the end and tore the strip in half for a frayed look. I stuck a length around the top edge of the box and used the scond piece to tie a little bow which I stuck to the top left corner. I stamped the dress form using brown ink shades and trimmed the skirt frame away so that I could stick it to one front edge after tying another ribbon around the waist. I really enjoy making pieces like this with lots of details and the Dressmaker set has just the right sized stamps to work well with a little box like this. I've not had this set for long, so am looking forward to making cards, tags and more individual pieces with these detailed stamps. Knowing that Darkroom Door stamps always give great detailed results saves so much time too, as I never have to re stamp anything! The teddy bear in Hello Baby vol 1 DDRS037 is worth buying this stamp set for on its own, let alone with all the other images and words in there. Whenever I've used the teddy on any of my demonstrations it always evokes "oohs and aahs". This is a simple tag but would be lovely tied to a gift for a new baby. I cut my tag from good quality 300 gsm white card, then used Victorian Velvet and Worn Lipstick Distress inks to stamp a collage of the safety pins, hearts and words over the tag. I blended Victorian Velvet over the tag once I'd heat set the images to avoid smudging. The teddy was stamped onto white card using Archival Jet black ink. I used Tea Dye Distress ink to shade him in. I added white highlights to his eyes and nose using a white gel pen followed by Glossy Accents to give dimension and shine to the features. I coloured Tim Holtz Crinkle ribbon using Distress Stains and added a length of this through the tag. I poked two holes in the teddie's neck (ouch!) and threaded another length of the ribbon through, tying into a bow at the front. I stuck the ends down with double sided tape to make sure that they covered the original ribbon image on the stamp. 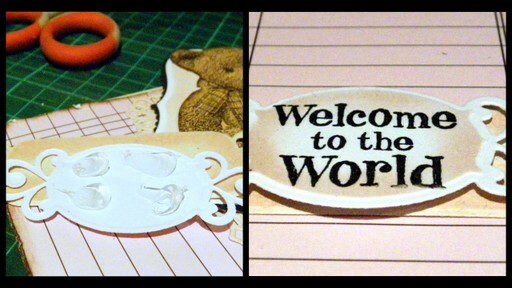 Once I'd stuck the teddy onto the tag with 3D foam, I stamped and added the Welcome to the World panel, again with 3D foam. A really easy project which just allows the quality of the images to take centre stage. Wow - aren't these projects amazing!! Thanks so much Lindsay for sharing your talents with us. 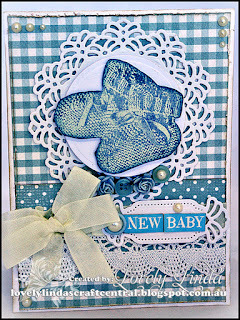 I love how Linsday has made the background on the baby tag look like patterned paper - all just from a few small stamps! We have more to share from Linsday tomorrow... she's been a busy girl I tell ya! I hope you'll join us again as there's loads to see tomorrow! Lives: I live in a village in Lancashire, England, not far from where I was born. After years of city life it's so peaceful that I wake up every morning and pinch myself! Known For: Designing stamps for British company Personal Impressions, demonstrating stamping and inky techniques all over the UK and designing projects for craft magazines. Hopefully known for having a good sense of humour too! Loves to: Inspire confidence in people to have a go at things that they are nervous of trying. Create pages in my Art journal. Make people laugh - or smile at least! Nature watch and potter in my garden. Loves to create: A mess.....no, seriously, that's just an unfortunate by product of my creativity! I really enjoy starting with a blank piece of card and creating something from nothing. I love working on Art Journal pages where I can combine various mediums as well as drawing and painting and where there are no rules. 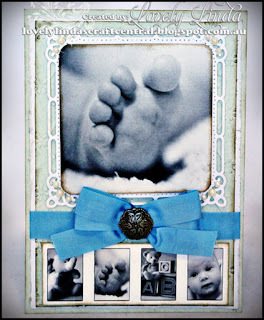 Favourite Darkroom Door product: I am a massive fan of DD stamps, the sets in particular. They always give perfect results and the images work so well together and for many techniques. I also love the Montage sheets, filmstrips and wordstrips. They are often just the finishing touch that I need and really easy to work with and to alter. Let’s say you’re invited to come into our darkroom for a day. What would you bring with you? A big smile, wide open eyes to take everything in, a big bottle of water and a fan to keep me cool but not my camera....I'd ask Rachel to take photos for me and email them to me when I got home! This was inspired by the DDRS078 Tick Tock stamp set. I thought it would be fun to use all, or most of the images in one project. I started by cutting a large cross from cream Bazzill textured card - ie a square with rectangles extended from each side. I scored and creased along each line, then smudged Frayed Burlap Distress ink over the card on both sides. I cut panels to fit all the sides, both inside and out, then covered these with white card that I wrapped around the panels to give a padded effect. Each panel was stamped with a selection of the stamps using Coffee Archival ink and I applied areas of the Mesh background stamp DDBS016 using my fingers, as opposed to an acrylic block - this way I could just add small areas of texture. 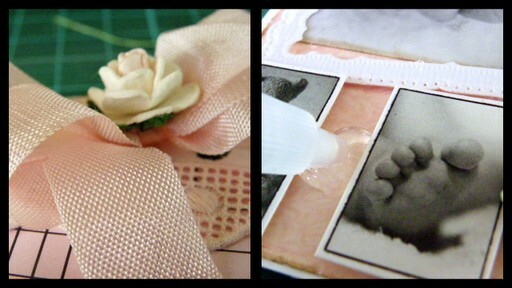 I then blended Vintage Photo Distress ink around the edges before attaching the panels to the outer box sides. The inside panels were done in the same way but I used Tea Dye for the edges and omitted the Mesh. A square panel stamped with Mesh covers the box base. The lid was formed from a slightly larger square with 2 cms flaps on each side which, once coloured as before, I folded down and secured with hand dyed ribbon which was secured with Red Line tape. A slim strip of inked card applied over the ribbon just helps to keep everything extra secure. I added another padded and stamped square to the lid and added a Tim Holtz Timepiece and Game Spinner using a brad. I next stamped several images from the set onto white card, cutting each out individually and sticking some back to back, edging them with smudged ink. I used Glossy Accents (and little tabs of card when necessary) to attach the different images and words to the inside base of the box, taking time ('scuse the pun!) to check they weren't too tall and that they looked alright from different angles. It's a fun to make project of a simple box that opens out when the lid is lifted to reveal the surprise centrepiece. I kept my colours very muted and monochromatic but it could be done in more dramatic tones for a very different effect. Another of my favourite stamp sets is the Art De Fleur Vol 2 DDRS040 with its postcard images with delicately shaded flowers. The card was formed from a sheet from one of Tim Holtz's Kraft Resist stashes. I stamped the floral panel onto gloss card using permanent black ink, then softly blended Marvy Le Plume pens over the image. I tore some of the edges of the panel, applied a glue stick over the torn areas and dipped into silver embossing powder to give random silvery areas. I matted the panel onto layers of card and tied a hand dyed ribbon down one side. The tag features the second floral postcard which I added to some dotty paper overlaid onto the tag. The velvet leaves are coloured with alcohol inks and I used natural twine to add an extra texture. Using gloss card allows the Le Plume pens to glide smoothly across the surface to create a seamless look which really works woth the fine detailing of these images. This Steampunk themed trio of cards and wall art were featured in a recent issue of the UK magazine Crafts Beautiful. I used a mixture of images from the DDRS068 Steampunk set (which has an amazing twenty one stamps in it!) as well as die cut gears and Idealogy metal items to create the look. The wall art was made using the tray from a large box of matches which I set into a piece of shaped mount card to create the recess. The two vintage gentlemen are, I think, my favourite images in this set, and I love the delicate detailing on the balloon. Don't you just love what Lindsday has created? Fantastic projects!! A big thanks to Linsday for sharing them with us! We have lots more to share with you for the rest of this week, so I hope you'll join us again tomorrow to see what else Lindsay has in store for us! Stamp the flowercollage on a piece of CS which has been colored with distress inks. Cut it out, following the squiggly line of it. Paperdistress the edges. Color it with some watercolorpencils to accentuate the flower. Tear masking paper to cover the outer part of the card. Stamp the images and text on the cardstock. Sponge the background. Paint watered-down gesso over the images and text when it’s too dark at this stage (you want your image to stand out). Remove the mask, make some doodles. Adhere it to the card and embellish as shown. Stamp the rose, mask it and stamp the text over it with a solvent ink. Splat some watered down distress ink over the CS. Color the rose. Find some nice scrapbookpaper which accentuates the colors (I colored the scrapbookpaper to match with the colors from the main part). Adhere to card as shown. Put some distress inks on your craftsheet and swipe your cardstock through it. Stamp the images with a solvent ink. Stamp the text around the edges with a lighter ink. Make a doodle around the edges, and also paperdistress it. Stamp the collaged-flower image on a piece of cardstock which has been colored with pearl-spray on the craft-sheet and swiping the cardstock through it (I had this in my stash). Cut it out. Paper distress the edges. Stamp the text and postage stamps on some coordinating scrapbookpaper. Sponge the edges with coordinating colors of distress inks. Stamp the postage stamp and only the text (from the main image) on the background. Find some nice lace, cover it partly with white acrylic paint. Adhere it to the card as shown. Put a stencil over some white cardstock and spray with different colors of pearl-spray. 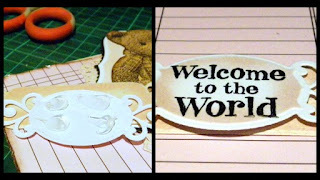 Stamp the images on a seperate piece of cardstock with StazOn Timber Brown, and cut it out. Stamp the text with the same ink on one side of the CS. Adhere the images to the background. Paperdistress the edges, tear it on one side, and accentuate it to also color the edges of it (as shown). Heat emboss the flowers with clear embossing on some bookpaper. Sponge over it with distress inks. Paint gesso all over the cardstock and leave to dry. Cover it with a piece of paper and iron the embossing off. Stamp the flowers and the dragonfly with a solvent ink. Color it with watercolor pencils, the flowers just at the bottom of it to give a shadow, and the top part of the embossed flowers also. Sponge the background with the same distress inks, and wipe it off with a wet cloth in some parts of the background. PLAY! What an inspiring week this has been! We'd like to say a HUGE thank you to Ellie for sharing her projects and talents with us! The ideas and techniques are so much fun so I hope all of you will try them out. And to all our blog readers... hope you have a wonderful weekend! Don't forget you can see more of Ellie's work on her blog here. Stamp the background with an acrylic block and red distress ink. Make a mask to fit this so that the outer part of the ATC gets covered. Stamp the flower with a solvent ink. Use a lighter ink to stamp the text, more than once, just to one side of the ATC. Remove the mask. Stamp the flower on a seperate piece of cardstock, cut it out, and adhere it to the ATC over the original stamped image. Make a doodle to accentuate the background. Color the flower with some watercolor pencils and also bring some of this color in the background. Tear some paper from a bookpage with some drawings from plants and some text on it (that second butterfly is from the bookpage!). Adhere it to some cardstock. Put some gesso over it with a credit card. While wet spray it with different colors of pearl-spray. Leave it to dry. Sponge over it, I used yellow here. Wipe over it with a wet cloth, to get some white back in some places. Stamp the images with a solvent ink. Stamp the butterfly on a seperate piece of cardstock, color it, cut it out, and adhere to background. Paperdistress the edges. Really, you have to try this, JUST PLAY! This one was fun to make! Stamp the collaged-flower image on a piece of cardstock which has been colored with pearl-spray on the craft-sheet and swiping the cardstock through it (I had this in my stash). Cut it out. Adhere it to white cardstock, and trim this to leave a white edge to it. Cover some cardstock just randomly with gesso, using an old credit card. While still wet, spray over it with the same colors of pearl spray. Leave to dry. If it is too dark at this stage, paint over it with watered-down gesso (you want your main-image to stand out!). Stamp the postage stamp and only the text (from the main image) on the background. Tear the cardstock on one side, and accentuate this with a pencil. Paper distress the edges. Adhere to card as shown. You will need petroleum jelly for this one. Cover part of some scrapbookpaper with some jelly. Paint over it with white acrylic paint. Leave it to dry. Stamp the text with a solvent ink. Now wipe off the cardstock with a dry papertowel, and it will remove the paint where it covered the jelly. Stamp the butterflies on a seperate piece of cardstock, cut them out and color them. Adhere to background. Sponge a piece of cardstock with distress inks. Stamp the text on it. Stamp your images on a seperate piece of cardstock, and cut it out. Adhere it to the ATC, color it with watercolorpencils. Make a doodle around the edges, and paperdistress the edges. Put some distress inks on you craftsheet, mist it with water, and wipe the cardstock through it. Leave to dry. Stamp the leaves with a brown solvent ink. Color the leaves with some green. Sponge the edges with green distress ink and paper-distress it. Adhere to card as shown. Lives: In Hoogeveen, in the Netherlands. I think they will mention my use of color, the very ‘own’ style, my preference of nature stamps; I get comments on these issues. …play with paper stamps and color! It’s the most enjoyable craft in the world, for sure! That’s not a difficult one! The stamps of course!! My number one must be the sets with the butterflies, but I also use the correspondence set a lot… and I just discovered how I LOVE the leaves stamp set as well…they are gorgeous! A chain, so you can’t throw me out the next day! Put different colors of distress inks on your craftsheet, and put the background stamp in it, turn it in the ink about 90 degrees. Mist the stamp just a little bit, and stamp it on your cardstock. Stamp the image of the flower on a seperate piece of cardstock and color it with the same shades of color as used in the background. Cut it out and paperdistress the edges. Stamp the postage stamp and only the text (from the main image) on the background. Put different colors of distress inks on your craftsheet, and put the background stamp in it, turn it in the ink about 90 degrees. Mist the stamp just a little bit, and stamp it on your cardstock. Use this background to create this card as shown. Put some distress inks on your craftsheet, mist it with some water. Put your cardstock in it, and mist it with some water. Make the color run to all sides. Stamp the butterflies on a seperate piece of cardstock, and cut them out. Make a ‘quick’ copy of the background, cut it out to create a mask (I sprayed the back of it with some glue-spray, and left it to dry thoroughly first). I used the piece that was left over after cutting it out! Put the mask onto the background, and stamp the text over it. Remove the mask. Accentuate the edges of the “splash” with some watercolorpencils. Adhere to card as shown. Stamp the flower collage part on a piece of cardstock which has been colored with distress inks. Cut it out, following the squiggly line of it. Paper distress the edges. Color it with some watercolorpencils to accentuate the flowers. Tear masking paper to cover the outer part of the card. Stamp the images and text on the cardstock. Sponge the background. Paint watered-down gesso over the images and text. Remove the mask, make some doodles. Adhere to the card and embellish as shown. Fabulous techniques!! We have many many more projects to share with you - so make sure you check the blog this week to see more of Ellie's fabulous work! Today we have some more beautiful projects by Guest Artist Irene Tan! The projects that she has shared with us over the past week have been nothing short of amazing!! So many details and innovative ways on using our rubber stamps... and wait until you see what she has in store for us today! A complete mini book with so many little details, please take some time to look over all of the photos, it really is a visual feast! Other Supplies: Acrylic Products: Clear Scraps; Pattern Papers and Stickers: 7 Dots Studio; Inks: Ranger Ink, Tsukineko; Chipboard: Dusty Attic; Flowers: Petaloo; Others: Making Memories acrylic paint, Ranger Gesso, May Arts ribbon, Advantus Corp metal embellishment, Beacon adhesives. Other supplies: Acrylic Products: Clear Scraps; Pattern Paper: Prima; Inks: Ranger Inks, Tsukineko; Chipboard: Dusty Attic; Flowers: Dusty Attic; Others: ribbon, brads, Beacon and other adhesives. Other supplies: Acrylic Card: Clear Scraps; Pattern Papers: Prima; Inks: Ranger Inks, Tsukineko; Others: burlap, twine, button, Ranger Glossy Accent, Beacon and othe adhesive. We'd like to say a HUUUUGE thank you to Irene for sharing her artwork with us and being one of our Guest Artists! It's been such a pleasure to have her here on the blog! If you'd like to see more of Irene's work, you can see it on her blog here. The cage has been covered in White Croco. 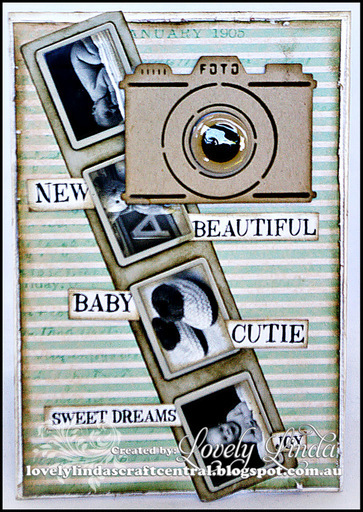 Here's another project that Angella has created using Maya Road chipboard, along with Darkroom Door stamps. We'd like to say a HUGE thank you to Angella for being a Guest Artist this week and for sharing all her talents and ideas with us! Please make sure you follow Angella's blog to keep up with what she's up to. Angella will be teaching at the Scrapbook Expo in June using some of the Viva Decor paints, so be sure to check out the class schedule when it becomes available! Made the backgound using gesso, Ferro Iron & Precious Metal Colour silver and a light blue chalk ink. The drift wood was made using a heavier coat of Ferro Iron. Beautiful projects and great ideas! Thanks so much to Angella for sharing these with us! We have a couple of projects to share with you again tomorrow, so please drop by!